First up a suggestion from AudioCulture content director, Chris Bourke. He thought we should go even further back than Johnny Devlin and give credit to the seminal rock’n’roll band put together by jazz musician Frank Gibson Sr. The band members learnt the revolutionary style of music by going to see the 1955 movie, Blackboard Jungle, which featured a hectic performance by Bill Haley and the Comets. This taught them not only the tunes but also the antics. Saxophonist Bernie Allen played on his back or lifted his instrument high in the air. Trombonist Merv Thomas did his best to follow Allen’s moves, even if the length of his instrument meant playing on his back was out. 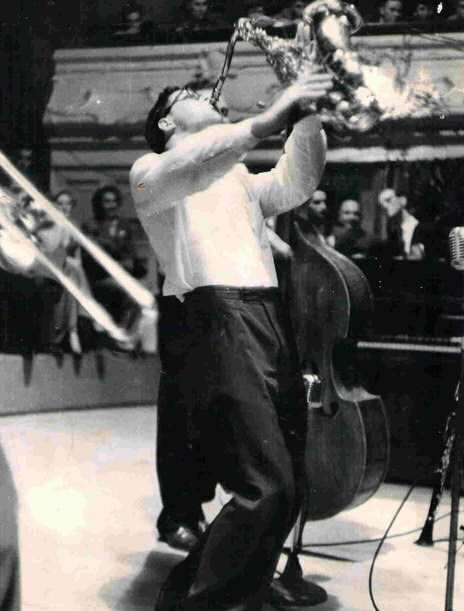 Meanwhile, Galvin Edser would clamber up onto the waist indents of his double bass to perch while somehow continuing to play in time (a trick that occasionally left him tumbling to the floor, instrument and all). This was the band that set the template for all other rock’n’roll wild cats to follow. Kathy Mould responded to our original list on Facebook by saying “Gareth Shute knows nothing” and linking to the trailer for a movie called Antarctic Angels and the Unknown Blues. 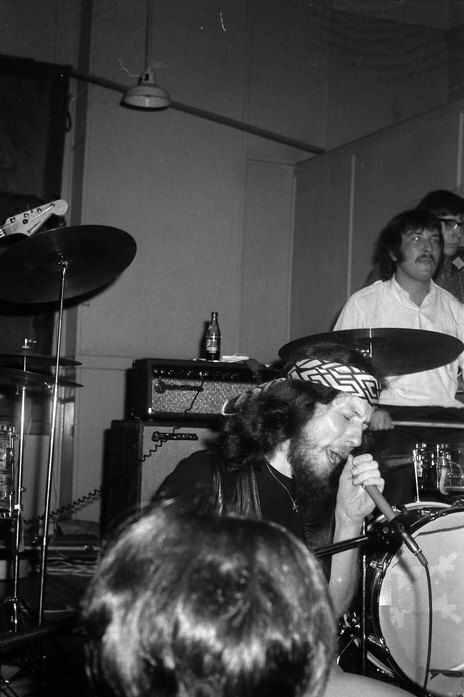 Back in the 60s, Antarctic Angels was a bikie gang that hung around Invercargill and The Unknown Blues was a band that regularly played at their house parties – an impressive way to build a rep! Lead singer Dave Hogan had been in the front row at the Civic as a schoolboy when The Rolling Stones came to town and met them twice during their visit to the city. Soon after, he burnt his school uniform and became a full-time musician, taking further inspiration from The Pretty Things’ NZ tour. At live shows, Hogan would either be blasting his harmonica from behind a flurry of hair or falling to his knees to scream out some vocals. An honourable mention also goes to bassist John Hancock: in one of the few surviving film clips of the band, he can be seen smashing a bass guitar to pieces. It was hard to pick amongst the punk bands who were suggested, among them Bones Hillman’s early group the Masochists, or 80s punk leaders The Spelling Mistakes. However in a lot of cases, the bands were wild in sound, but actually didn’t get too crazy onstage. When reader Brian King suggested The Warners, I thought it was very fitting but decided to extend it to include the trio of West Auckland based bands that Allen “Nobby” Stephenson fronted throughout the 80s. Changing the band name was one way the musicians could keep getting gigs in the city, though even as The Warners they found the sheer volume at which they played meant a lot of bar owners were not keen on having them (and when they played the Gluepot, they had to provide a $750 bond to cover any damages incurred). 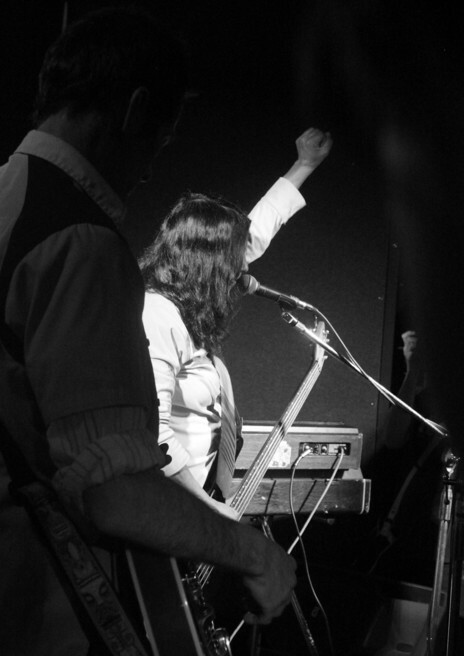 Their sound was bordering on metal, but the moshpit remained as ferocious as ever, as can be seen in this live video filmed for Radio With Pictures. Mike Halsted suggested a trio of acts that emerged from the Frisbee stable: Psycho Daizies, Marty Sauce & the Source, and The Rock and Roll Machine. The Psycho Daizies were notorious for an egg stunt in 1992, where they asked the audience to bring eggs along to pelt at them (as a warm-up, members of the group hurled a few at The Nixons at an outdoor show a week earlier). For their own show, the band bought the cheapest eggs they could find, but they ended up being old and rotten. Their soundman handed out eggs to everyone and it became a free-for-all – a messy food fight that was filmed by TV3 and shown it on the late-evening news show, Nightline. However, the band went on a national tour the next day and gradually found that that eggs that they hadn’t cleaned off properly soon became permanently attached to their equipment – for years after, they found bits of egg across their amplifiers. Many of the band went on to long careers in the local music scene: guitarist Dave “Wildman” Graham had his own group The Rainy Days, while bassist Rich Mixture played in Shaft, Dead Flowers, an early line-up of The D4, and The Jordan Luck band. 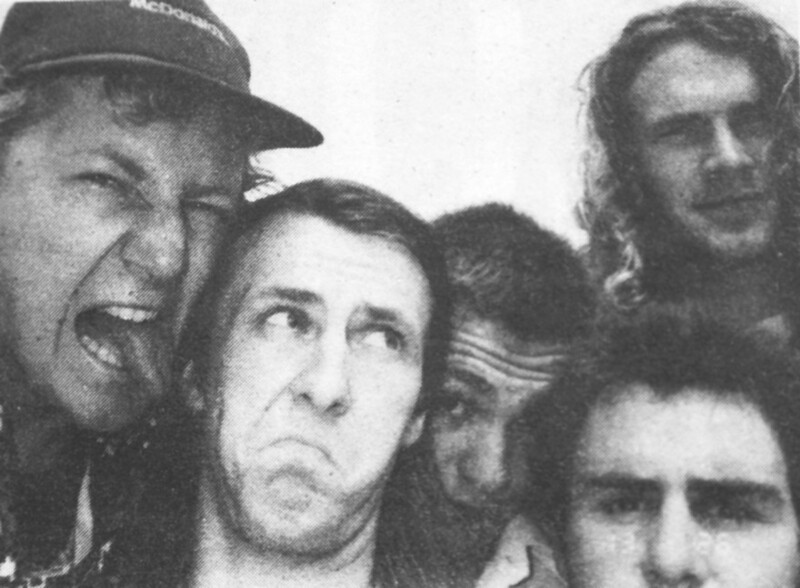 The Psycho Daizies in 1992: John Psycho Daizy, Tegal Chicken, Pikelet, Rich Mixture and Dave “Wildman” Graham. King Loser have been a lot of people’s minds lately since the sad passing of organ player, bassist and occasional singer Celia Mancini. Liz Penman Parker and James S Kohler both pushed for them to be on this list. Certainly, they were a live force to be reckoned with: Mancini moved around the stage like she was possessed, while Sean O’Reilly and Chris Heazlewood played their guitars as if they were coaxing noises from another dimension. The band’s energy also came from their combustible nature, with Mancini being the type of person a weaker willed individual might call “a handful” – the truth being that the world was her stage and the band never took prisoners when they came together in a room. Blair Morton and Jason Peters both suggested Pumpkinhead, as Peters explained: “Nothing quite like being in the pit and getting sprayed with flammable liquid and licked by fire!” It certainly gained the audience’s attention when lead singer Brent Milligan brought his fire-breathing routine to the live stage, taking a swig of kerosene and blowing at a burning torch to send a fireball out over the audience. Eileen Wanda suggested this early 2000s punk band for this list and you have to respect a band who disliked television so much that they destroyed a couple of dozen donated televisions over their decade-long career. Their music and politics took the same straight-to-the-point approach of punk pioneers like Crass, and they weren’t afraid to take their protest to the street. 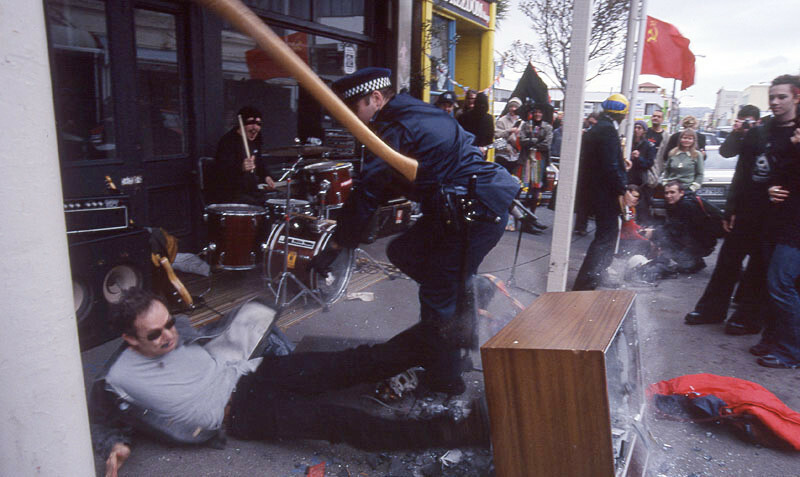 One of their Mayday shows/protests on Cuba St, Wellington, ending up putting them at odds with the police, who took particular exception to lead singer Ken Vicious wielding an axe (in the midst of smashing another television) and they threw him to the ground, breaking his arm. Sharon Horring suggested The D4 be added to our list – they were mentioned in the original list, but certainly justify their own listing. While the overseas acclaim of The Datsuns may have eluded them, they could certainly compete when it came to putting on a rock show. When Jimmy Christmas was at the mic, he always looked like he was a second away from leaping in the air, while his off-sider Dion Palmer took advantage of his greater freedom to stalk around the stage, hold his guitar like a weapon or head out into the audience. 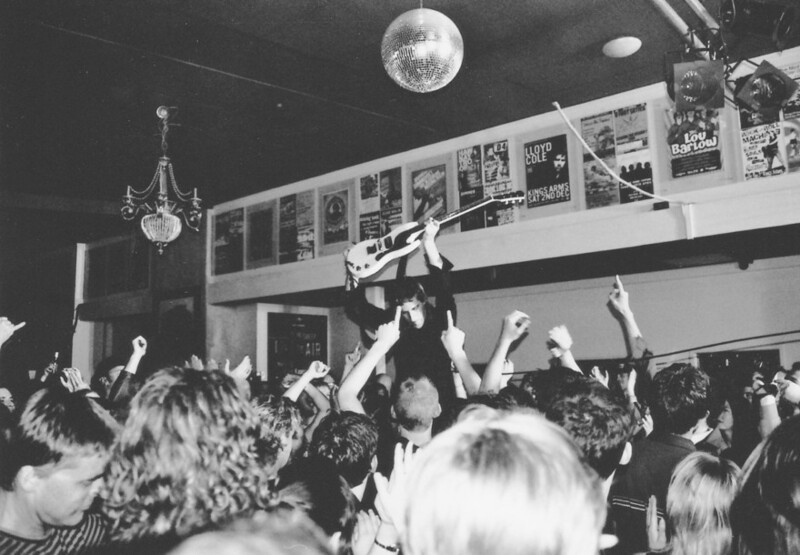 Here is Palmer in the midst of a guitar solo, being held aloft by the audience and eventually moving so far out from the stage that it is no longer even visible. 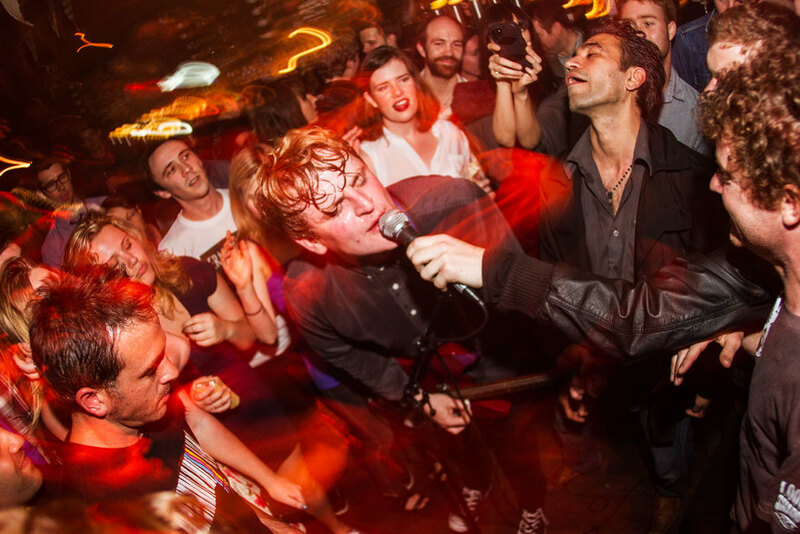 Connan Mockasin was a contender for the original list of wild ones, but we didn’t quite have room. However, it’s entertaining to reflect on how much his live approach has evolved over the years. Certainly, his current career as a cult artist in the UK (appearing on albums by Charlotte Gainsbourg and Fatboy Slim) would give you no clue of how he got started. Mockasin came from rural Te Awanga and turned up in Wellington around 2003 with the notion that audiences were hankering for some Hendrix-inspired electric blues. 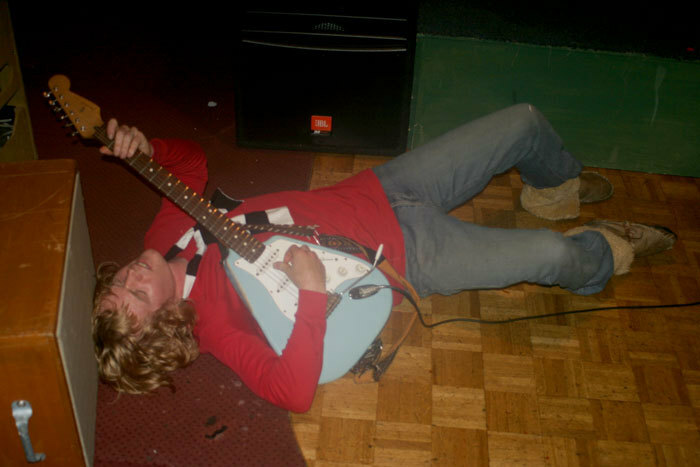 They weren’t of course, but his antics soon convinced them – playing the guitar behind his head, picking notes with his teeth, and jumping around until he crashed to the floor, still riffing away. He took this show to the UK and made an instant impact in the clubs of London. His music slowly became more psychedelic (initially) and then strangely took a turn towards smooth soul, until it was hard to square him with the wild man he’d once been. Though those who saw him in those early days could hardly forget. Lastly, I thought I’d add one final act according to my own whims, since I found it crazy that no one had suggested them. Die! Die! Die! initially had an approach to live shows that could best be described as “shock and awe”. They’d blast off at full volume and in continual motion, then it would all end abruptly after just 20 minutes of fury before the audience had a chance to catch their breath. 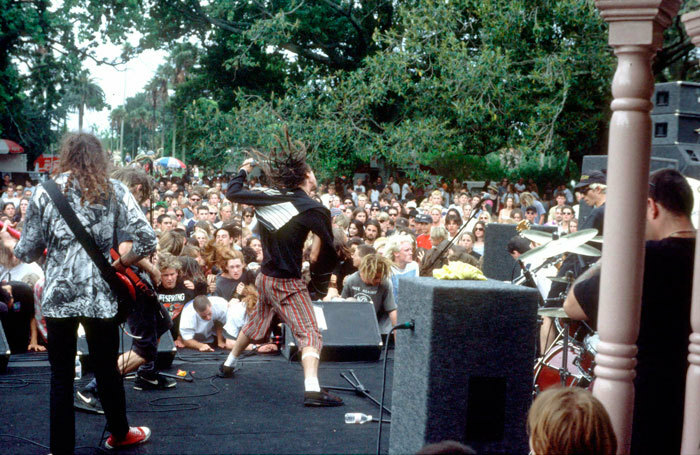 They were also a band that liked to play on the same level as the crowd, putting themselves amongst the moshing throng of fans. On these occasions, the mic stand was often swept aside, leaving an audience member to hold it up so Andrew Wilson could keep singing. And is that the sedate music editor from The Spinoff, Henry Oliver, that you see falling about the stage and thrashing distorted basslines out of instrument? Yes, yes it is.